A few months ago, the amazing people at the Alaska Seafood Marketing Institute reached out to me after Christine and I talked with Maureen during our Salmon Google Hangout. They wanted me to give Alaskan salmon a try as well as some of the other seafood species native to Alaska. This was a perfect offer for me to accept since we love seafood in our home. I had my box of seafood delivered to my office, and I must say it was quite comical. The mail room was confused and my coworkers weren’t too happy that my big box took up 1/3 of our community refrigerator. I called my husband, Jon, and told him that we were having a fancy-pants dinner that night. If you follow me on instagram you might have saw a random wednesday night indulgence of Alaskan King Crab legs among other sides. After our feast I started dreaming up recipe ideas. And well… then we went on vacation, and now its November, and I finally got to dig into the delicious Alaskan seafood! I wanted to make butternut squash risotto the other week; however, thats when I realized I didn’t have any arborio rice! So I went to the next best thing… orzo pasta. Not the same, but worked. I was still trying to figure out what to pair with this pasta when it dawned on me that I had plump and juicy Alaskan scallops hanging out in my freezer. That’s when I got this really crazy idea. Why not sprinkle some pumpkin pie spice on them!??! Crazy thought turned AMAZING. The flavors complimented one another so well. I can’t wait to make this recipe again! In a large pot pour one tablespoon olive oil and heat at medium-high heat. Add the onions and cook for 1-2 minutes. Then add minced garlic and cook for an additional minute. Add orzo pasta, toasting for one minute (and constantly stirring). Then pour in one 32 ounce box of chicken broth. Place a lid on the orzo, bring to a boil then reduce down to a simmer. Cook for 15 minutes. Stir occasionally. Add in the roasted butternut squash and cook for up to 5 more minutes or until most liquid is absorbed, pasta is cooked, and butternut squash is warm. During the last 10 minutes of the orzo cooking begin preparing the scallops. Rinse scallops, then pat dry. In a small bowl mix together all the spices; dried thyme, dill, garlic powder, and pumpkin spice. Sprinkle salt on top of the scallops followed by sprinkling the dry spice mix (on one side--you will have spice mix leftover). In a frying pan add butter and olive oil and heat on medium-high heat. Add seasoned-side of scallops face down on the pan. Then sprinkle with additional salt and remaining herb mix. Cook for 5 minutes then flip the scallops. They should have a nice caramelized color on the bottom. If not kick up the heat to high. Cook for an additional 5 minutes or until internal temperature is 165 and both sides of the scallops are caramelized. Serve on top of a bed of butternut squash orzo. This recipe requires pre-roasted butternut squash. Roast a big batch and use it throughout the week! To roast: peel and cut butternut squash, toss with olive oil, salt, and pepper and roast at 450 for 20 minutes or until soft. Disclaimer: I received seafood from Alaska Seafood Marketing Institute for free; however, I was not compensated to write this post. All opinions are my own. 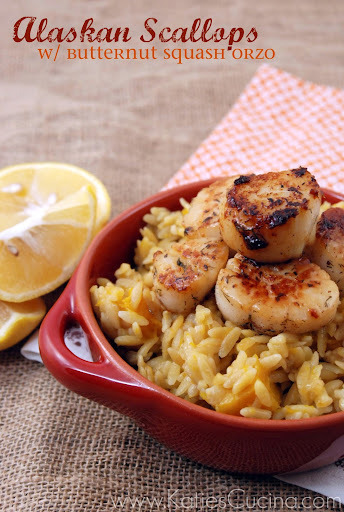 I love all things seafood, especially scallops! I need to get in the habit of keeping it in my freezer more often! I try to keep seafood in the freezer as often as possible that way I always have something to fall back on! These spices sound so perfect for scallops…I bet it’s such a perfect combo for the sweetness of the scallops. Love the orzo too! Thanks Cassie. The dish really married well together! Katie, I love scallops and I can see them working really well with the squash and the touch of spice. Looks wonderful! A unique and tasty looking way to prepare scallops 🙂 YUM!! I have not made yet but am thinking about adding a 1/4 cup of chopped dried cranberries to the orzo. Oh Jen that sounds like a great idea!